In my purging, I also found a newspaper clipping from November, 1987. It's a 900# female sturgeon (found dead), that had about 100# of caviar inside her. They think it probably died of old age, and they can live 100 years. Yah. But, swimmers, fear not. They're bottom feeders. Still... I wouldn't want that thing brushing up against my legs! What a fish! Is sturgeon caviar eaten? I don't know much about caviar. Gives more credibility to the Loch Ness Monster, no? Joey, it's kind of funny, because apparently before they found the fish there had been reports of a "duck-eating monster". Yah. Cathy, there are several kind of sturgeon and the beluga sturgeon are the ones famous for their caviar. 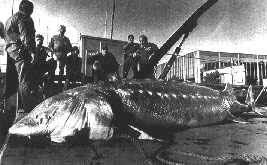 This freshwater sturgeon was in a large (urban!) lake and I have no idea if it's a kind of caviar people eat. To be honest, I can't imagine being hungry enough to want to eat fish eggs. Which probably goes to show just how uncultured I am! That is one enormous fish! Imagine what 100# (is that lbs?) of caviar would fetch! I may never swim in our lake again. EGADS! I have no desire to eat fish eggs, either. Blech (I'm definitely not a gourmet, lol)! Agreed - I would not want that brushing up against me, either! I'm trying to get my blog back into some active shape. I wondered if you would mind if I used a form of your "Grasshopper Days" as a basis for some posts? I do like how you share snippets of your life and it might actually be something I can do that won't disrupt my schooling. Did you find that template somewhere, or create your own?